The most popular style, the two-car garage plans in this collection feature a wide variety of architectural styles and sizes that can easily be suited to coordinate with your existing house design. Many homeowners also require additional storage space, so many of the 2-car garages in this collection provide the extra storage space so often desired by homeowners today. 3351 Sq. Ft., Width 46'-0", Depth 80'-6"
1040 Sq. Ft., Width 26'-0", Depth 40'-0"
1392 Sq. Ft., Width 30'-0", Depth 28'-0"
3195 Sq. Ft., Width 50'-0", Depth 42'-0"
509 Sq. Ft., Width 33'-4", Depth 28'-5"
1301 Sq. Ft., Width 24'-0", Depth 36'-0"
500 Sq. 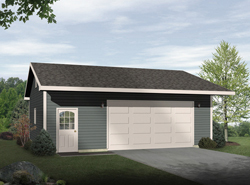 Ft., Width 40'-4", Depth 30'-0"
Our collection of project plans includes 2-car garage plans in many different styles and sizes perfect for all of your needs. We offer easy-to-follow blueprints that allow the buyer to envision the look of the finished project, right down to the smallest of details. With a wide variety of two-car plans to choose from, we are sure that you will find the perfect garage to fit your needs and lifestyle demands.